The term organelle is derived from the word ‘organ’ and refers to compartments within the cell that perform a specific function. These compartments are usually isolated from the rest of the cytoplasm through intracellular membranes. These membranes could be similar to the plasma membrane or made from a different complement of lipids and proteins. 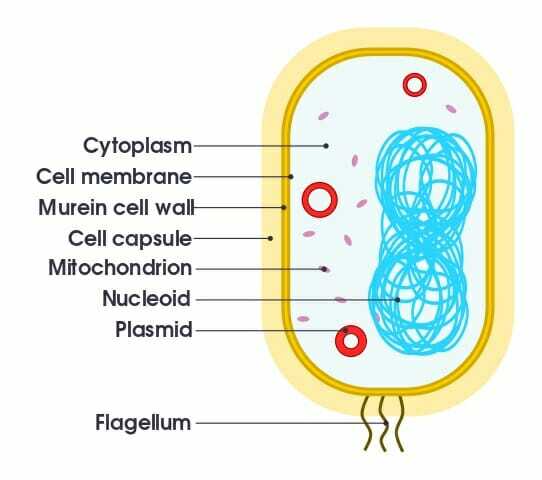 The properties of a membrane are due to its origin, such as with mitochondria or plastids, or due to its specific function, as seen with the nuclear membrane. A few organelles are not membrane-bound and are present as large complexes made of RNA and protein, such as ribosomes. 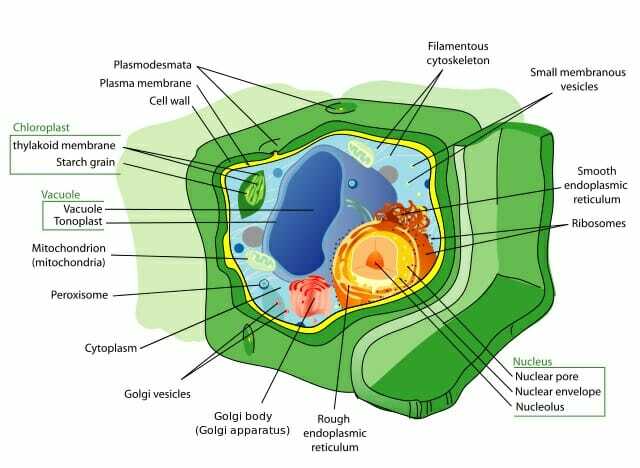 Images below are representations of plant, animal and bacterial cells showing common organelles. There are three major challenges for cells as they create organelles. The first is the formation and maturation of the basic building blocks of the organelle. This includes the membrane, its membrane-bound macromolecules, and the cytoskeletal machinery that shapes the organelle. In addition, the organelle needs to contain the right chemicals – proteins, amino acids, lipids, carbohydrates or their monomers, along with co-factors, enzymes and signaling molecules. These molecules have to be specifically, and often actively, transported into these subcellular compartments. Finally, organelles need to be maintained across the life of the cell and segregated accurately during cell division. There are a number of different strategies used by cells across the living world to accomplish these tasks. Different cell types often have a predominance of a certain organelle depending on their primary role in the body. For instance, cells of the parenchyma in leaves are full of chloroplasts, while cells forming the root are often deprived of this organelle. An active single-celled organism such as a paramecium could have a rapidly changing vacuole. Cells involved in protein secretion usually have a well-developed Golgi network and prominent rough endoplasmic reticulum. In eukaryotic organisms, nearly every cell has a nucleus (exceptions include mammalian red blood cells). The other common organelles seen are mitochondria, plastids (among autotrophs), endoplasmic reticula, Golgi apparatus, lysosomes, and vacuoles. Some special cells like neurons also contain synaptic vesicles. All of these structures are membrane bound. Macromolecular complexes like ribosomes, spliceosomes, centrioles, and centrosomes are not surrounded by a membrane, but are important organelles in most cells, performing vital functions like organizing the cytoskeleton, synthesizing proteins and processing RNA. Bacteria contain both protein-bound and lipid-bound organelles. These can be made of a simple monolayer membrane (example: carboxysomes) or from a bilayer (magnetosomes). Organelles in prokaryotes are being studied more extensively now, especially with the advent of better experimental tools. Organelles can be classified in a number of ways. The simplest classification is based on their origin: whether they are present in prokaryotes or eukaryotes. While many important biochemical pathways between these two cell lineages share a common ancestry, a complex cell plan sets most eukaryotic cells apart. The origin of this particular kind of complexity is not well known. Eukaryotes are able to carry out finely regulated chains of biochemical reactions primarily due to their ability to have subcellular specialization. In addition, the presence of organelles that can generate ATP also provides the energy to drive these metabolic reactions and sustain a larger cell. On the other hand, prokaryotic genetic material is located in semi-organized regions called nucleoids that are generally seen as a part of the cytoplasm that contain most of the genetic material of the cell. Magnetosomes are another kind of prokaryotic organelle, practically unique in being bound by a lipid bilayer. These structures are formed by actin-like cytoskeletal structures that are involved in shaping and locating the organelle within the cell. This simplistic classification occasionally runs into difficulties, however, especially with structures like mitochondria or chloroplasts that are considered ancient endosymbionts. However, as a rule, prokaryotic organelles are often simpler with lesser complexity in terms of chemical composition, and membrane structure. Even within eukaryotic cells, the presence and nature of the membrane around a subcellular compartment is a common method of classification. While major compartments such as lysosomes and endoplasmic reticulum are bound by a lipid bilayer, many important, but smaller organelles interact freely with the cytoplasmic environment. These organelles are not fluid-filled, and instead are solid masses of proteins, RNA or both. Ribosomes and spliceosomes are common examples for organelles that are not membrane-bound. Some people classify the cell walls of plants and bacteria under this category as well, since they created primarily from cellulose. However, it is located outside the cell membrane and therefore, cannot be truly considered an intracellular structure. Finally, some organelles can reproduce independent of the cell cycle, because they contain their own genetic material. Here plastids and mitochondria are of particular significance. However, while they reproduce even when the cell is resting in G0 phase, they need to import most of the duplication machinery from the cytoplasm, thereby making them intimately linked to the needs of the cell. Mitochondria and chloroplasts contain unique genetic material, independent of the rest of the nucleus, and in many cases, their number within the cell can change. For instance, muscle fibers that face an increase in their need for ATP, often respond by increasing the number of mitochondria in the cell. Plants and other autotrophs can show similar adaptations with chloroplasts. The activities of a single cell mirror those of an organism. The cell ingests nutrients, digests and transforms them, metabolizes them to form larger molecules, respires and releases wastes. Most cells even contribute to the maintenance of the extracellular environment, not unlike the existence of many species within social structures. Unicellular organisms ingest food as large particles from the environment and undergo intracellular digestion. This needs the presence of organelles such as food vacuoles or phagosomes and lysosomes to carry digestive enzymes. For multicellular organisms, some specialized structures deliver nutrients to the cell, which then takes them up in bulk or through special transporters. In most large animals, the digestive system takes care of the ingestion and breakdown of food into monomeric units like glucose and amino acids. The enzymes needed for this process are synthesized on the rough endoplasmic reticulum and secreted through the Golgi network. Digested food is delivered to each cell through the circulatory system, which then allows passive transport or uses energy to actively take up nutrients. Intracellular transport is often managed through crisscrossing cytoskeletal filaments that act like corridors. These filaments form a series of pathways that position organelles and transport materials. In this activity, they are aided by motor proteins that usually contain two domains – one to interact with the cargo and the other to navigate the cytoskeletal filament. For example, most neurons contain a long axon that conducts electrical impulses along its length. Synaptic vesicles containing neurotransmitters often populate the end of an axon and are necessary for the transmission of the electrical signal from one neuron to the next at the synapse. The components of these vesicles are moved towards the synapse along the path created by microtubules. Motor proteins called kinesins power their movement. Other materials such as enzymes or peptide hormones are transported through the Trans Golgi Network to either be used by the cell or be released through exocytosis. The most dramatic events of intracellular transport occur during cell division. Chromosomes are accurately segregated and transported to opposing poles of the cell through complex and tightly regulated cellular machinery. This involves centrosomes, dynamic microtubule arrangements and multiple changes to chromosome structure. Lysosomes are the main structures involved in intracellular digestion. They contain a number of hydrolytic enzymes that are activated by the acidic pH of these organelles. These enzymes are synthesized in their inactive forms in the cytoplasm before being transported into the organelle through transmembrane channels. Lysosomes can fuse with other organelles, such as phagosomes, for bulk digestion. This plays an important role in immunity as well, when pathogenic microorganisms are ingested by cells of the immune system and destroyed through the action of powerful hydrolytic enzymes. Heterotrophs often rely on mitochrondria for aerobic respiration and ATP generation. Autotrophs channel the energy of solar radiation or other chemical processes to forge the high-energy bonds in ATP. The membranous structures of both these organelles are important in the generation of ATP. Large, complex organisms need to use a nervous system and endocrine system to maintain homeostasis. 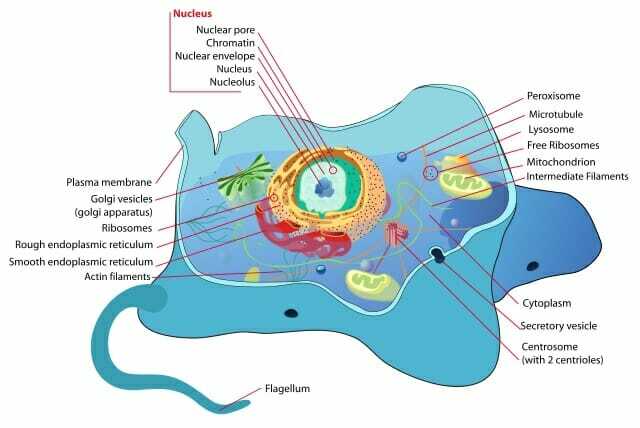 Within a cell, the most important organelle for control and regulation is the nucleus. Cells receive information about the external environment through complex signaling cascades that often result in changes to its RNA or protein content. Therefore, the nuclear environment is tightly regulated and import and export of materials through the nuclear envelope is an important process for the cell. The nuclear membrane has a number of special structures called nuclear pores and transport proteins called importins and exportins mediate the entry and exit of macromolecules. These macromolecules can induce a particular gene to be upregulated, influence the splicing of RNA, signal the beginning of cell division or even begin the process of apoptosis. Motor Proteins – Proteins that function as molecular motors, converting chemical energy to mechanical energy, while moving along a suitable surface. Upregulation – In genetics, refers to an increase in the number of RNA transcripts produced off a gene. Can also refer to the increase in the number of receptors found on a cell surface. 1. Which of these is a function of mitochondria? A is correct. Both ATP and GTP can be generated during the Kreb’s cycle within mitochondria. Though mitochondria can duplicate within the cell, their main function is not to be involved in the process of cell division. Similarly, while the transmission of nuclear genetic material is an energy intensive process, it is not reasonable to implicate the mitochondria in that process. 2. Which of these statements is true about intracellular transport? B is correct. Segregation of chromosomes during cell division involves a number of proteins and multi-protein structures and organelles, and the centrosome plays an important role in this process. Motor proteins that carry synaptic vesicles usually travel along microtubules, not actin filaments. The smooth endoplasmic reticulum is primarily involved in lipid metabolism and synthesis. The rough endoplasmic reticulum and the Golgi apparatus are the structures crucial in the synthesis of proteins that need to be secreted through exocytosis. 3. Why does nuclear import and export need to be tightly regulated? D is correct. The nucleus is the center for control of homeostasis within the cell and directs its growth, metabolism and eventual death. The presence of specific molecules – especially enzymes, or signaling molecules – can change the expression of genes, either increasing or decreasing the rate of transcription. The processing and export of this RNA determines the protein content of the cell. Nuclear transport is also important in both cell division and cell death.